The idea of adapting the Airbus model to industrialise energy renovation and deliver zero energy/carbon building stock is not new. A report commissioned, last year, by eceee and several partners of the Renovate Europe campaign made an analogy between the Airbus model and the industrialisation of energy renovation, as shown in figure below. Just like for Airbus, the report argues for the use of Enterprise Risk Management (ERM) theory to assess risks, manage exposure and seize opportunity of energy renovation. ERM theory was first developed and implemented by the car industry in the United States in the 1920’s. The discipline became a widespread practice in industry as it aligns strategy, processes, people, technology and knowledge to manage uncertainties and create value. To put it in simple words, ERM allows to simplify risks and get them right in a complex environment. A risk management initiative known as “Power 8 programme” was developed by Airbus group to manage the development, marketing and operations of the A380. The first step of the “Power8 programme” was to identify the risks and group them by categories. The second step was to identify risk owners. In fact, each risk category was assigned to a specific structure or risk owner which had the duty to carry the risk burden. The requirements for the risk owners include having the knowledge, experience and ability to establish real leadership of the risk category. One important criteria when assigning risks to a specific structure was to make sure risk categories are well-aligned with the business model of the organisation. Furthermore, “Power8 programme” recommends creating new structures if needed. 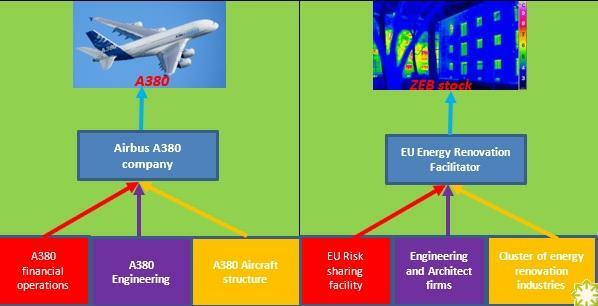 In the case of the A380, analysis of risks led to the establishment of the Airbus A380 company which played the role of a central risk function. It oversaw all risks and dealt with them using customised solutions. The key feature of the central risk function is not to mitigate any risk and to report to high level decision makers. Finally, all structures are grouped in a business model which ensures that there is no overlap between the mandates of the structures and that financial and human resources are secured for each structure. Last but not least, the “Power8 programme” recommends the use of high-tech knowledge platforms with a visual of risk categories to help understand and share risk mitigation efforts, the status of risk opportunities and to facilitate the evaluation of the overall process. An A380 engineering structure to manage technical risks and ensure the supply chain deliveries are of high quality. An EU energy renovation facilitator: The One-Stop-Shops proposed by the Smart Finance for Smart Building Initiative could play this role. However, for the One-Stop-Shops to play a facilitator role, they should not mitigate any risk, should report to high level policy makers, should not overlap with existing structures (such as banks and third-party financing structures, investment platforms or energy advisors) and should have the knowledge to establish a real leadership in the renovation market. An EU risk sharing facility: The investment platforms proposed by the Smart Finance for Smart Building initiative could play this role if they bundle all existing funds (EU and national ones) to increase the triggering effect of public finance and to back loans by a guarantee allowing for financial de-risking. A pool of engineering and architecture firms: This should be a practitioner-led initiative to share knowledge and to propose customised solutions to industry to build zero energy renovation kits for each building type, climate zone and construction period. An aggregator of the supply chain: This should be an industry-led initiative to deliver zero energy building stock. It may disrupt existing business models but would certainly lead to the modernisation of the construction sector. Looking to energy renovation as an industrial project shows that Europe has the ingredients to industrialise energy renovation. Not too many changes are needed to ensure existing instruments will deliver on Europe’s climate and energy targets while meeting other sustainable development goals. Let’s hope EU leaders will call at the 2017 Renovate Europe Day for an Airbus to renovate Europe! This column was published for the first time on October 10th, 2017 on eceee.